Note: The year in parentheses is the year the professor joined the faculty ranks. President Judith Rodin is the first woman to win the Greater Philadelphia Chamber of Commerce's William Penn Award. Recipients of the award are chosen for their "personal, professional and community contributions to the Greater Philadelphia region and their efforts to transform the region into a better place in which to live, work and play." She was honored at the Chamber of Commerce's Awards Gala last month. They cited "Dr. Rodin's leadership at Penn for driving the school's growth, doubling its research funding and tripling its endowment. A record number of undergraduates have applied to the university under her tenure, while Penn has become one of the top five national research universities. In addition, Dr. Rodin oversaw a $1 billion construction program that added new classrooms, administrative buildings and other facilities. The work Penn has done at the University has spilled over into its West Philadelphia neighborhood, bettering the community in terms of stabilizing its population and increasing property values." 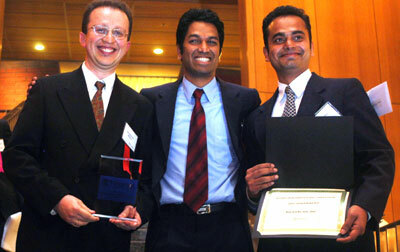 This year's grand prize winner of the Wharton Business Plan Competition Venture Fair is the student team InfraScan. Their device, called a HematoScope, is aimed at providing a fast, reliable and inexpensive way to diagnose the 50% of U.S. hospital emergency room patients who do not receive a CT scan. The company which consists of Wharton MBA students from India and an ex-Israeli Air Force captain, is basing its HematoScope on the patent of co-founder, Dr. Britton Chance, Eldridge Reeves Johnson University Professor Emeritus of Biophysics, Department of Biochemistry and Biophysics. Dr. Chance, the 1974 winner of the National Medal of Science and a member of the gold medal winning 1952 U.S. Olympic Yacht team, has a long history of awards and inventions. The second prize winner was CelfCure, Inc. for technology aided stem cell harvesting from patients for disease self-treatment. Third prize went to BioSpectrum, for fast, low cost protein screening for billion dollar drug discovery market. Dr. Mary D. Naylor, professor of nursing, director, RAND/Hartford Center for Interdisciplinary Geriatric Health Care Research, has recently been named one of three McCann Scholars, in recognition of outstanding mentorship. The Joy McCann Foundation provides awards of $150,000 recognizing the recipient's success as an educator and a mentor in teaching, research or patient care. Dr. Naylor has garnered a national and international reputation as a geriatric scholar, combining her humanistic concern and respect for vulnerable elders with rigorous science to create innovative models to enhance the care and health outcomes of this population. She has also earned the respect of her students and peers as an outstanding teacher and mentor. Especially noteworthy is the leadership Dr. Naylor has demonstrated in promoting educational and research collaborations among scholars and students from various disciplines. Colleagues say "she is a mentor, collaborator, clear thinker and a real leader in her university and her field." Dean Afaf Meleis said, "As Dean of the School of Nursing, I have watched Dr. Naylor mentor younger faculty and students successfully for many years. She inspires, challenges, and supports these new scholars to reach their highest levels of achievement in geriatric nursing. Her special brand of scholarship also works to translate research into best practice models of care." "The best great doctors I know say they had great mentors who helped shape their careers," said McCann Foundation Chair Scholar founder Joy McCann Daugherty of Tampa, Florida. "Our Foundation wants to promote the concept of mentoring and nurture the practice of mentoring by calling attention to outstanding mentors and rewarding their efforts." Edward Webb, a graduate student in political science, has received the Janet Lee Stevens Award, given annually to a graduate student in Arabic and Islamic Studies who, in addition to showing exceptional merit in his or her academic performance, fulfills the spirit of the Award by working to improve relations with and understanding of the Arab world (Almanac March 16, 2004). 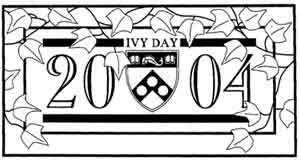 The 2004 Ivy Stone was designed by Raymond P. Ciarcia, E '04, and will be placed on the southside wall of College Hall facing Wynn Commons. The jet black granite stone will be the 43rd Ivy Stone to be placed on College Hall. To see a photographic archive of Ivy Stones (from 1873 to 2001) visit www.library.upenn.edu/exhibits/pennhistory/ivystones/ivystones.html. The following Penn students are among recipients of external awards this year.